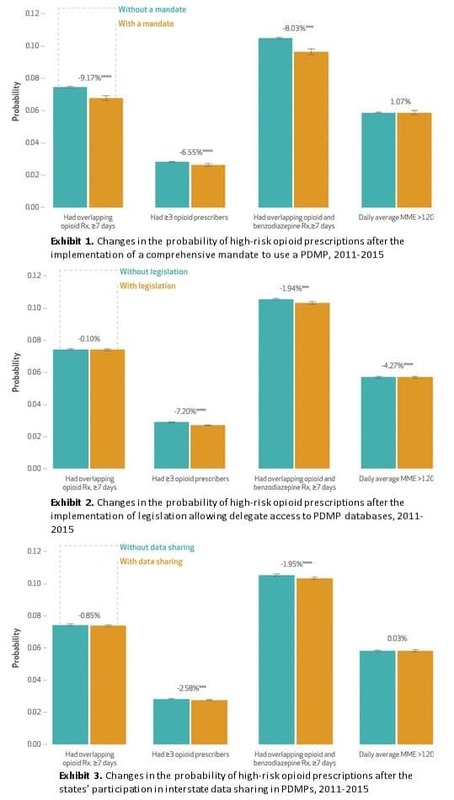 A recent study in Health Affairs by CHERISH Research Affiliate Dr. Yuhua Bao and CHERISH investigators Dr. Zachary Meisel and Dr. Bruce Schackman examined the impact of prescription drug monitoring program policies on high-risk opioid prescriptions. Prescription drug monitoring programs (PDMPs) are statewide databases of controlled substances dispensed at retail pharmacies. Currently, all states and Washington D.C. except Missouri have operating PDMPs that allow prescriber access. In her previous work with Dr. Schackman and Dr. Brandon Aden, Dr. Bao evaluated the effects of different PDMP use mandates on opioid prescriptions in the Medicaid population, finding a reduction in the use of Schedule II opioids by Medicaid enrollees in states with registration and use mandates. In this study Dr. Bao and colleagues focus on the effects of comprehensive use mandates, prescriber delegate legislations and interstate data sharing on high-risk opioid prescriptions in commercially insured patients. High-risk opioid use was defined by multiple overlapping opioid prescriptions, opioid prescriptions from more than 3 providers which could indicate doctor shopping, overlapping opioid and benzodiazepine prescriptions which increases risk for overdose, and high dose opioid prescriptions as indicated by a daily average morphine milligram equivalent of 120 or more. Using a natural experiment design, investigators found that comprehensive use mandates requiring physician use of the PDMP were associated with a 9.2% reduction in the probability of overlapping opioid prescriptions, a 6.6% reduction in the probability of having 3 or more prescribers, and an 8% reduction in the probability of having overlapping opioid and benzodiazepine prescriptions. They did not observe an immediate effect on high dose opioid prescriptions although the estimated effect strengthened over time. Policies that allow prescribers to delegate access to office staff or other licensed professionals to reduce physician burden were associated with a 7.2% reduction in opioid prescriptions from more than 3 providers, a 4.3% reduction in high dose opioid prescriptions and a 1.8% reduction in overlapping opioid and benzodiazepine prescriptions, which strengthened overtime. Interstate Data Sharing that allow prescribers to view prescriptions in neighboring states were associated with a 2.6% reduction in having 3 or more prescribers, and an 2% reduction in overlapping opioid and benzodiazepine prescriptions. A reduction in overlapping opioid prescriptions and high dose opioid prescriptions was seen overtime. Taken together these findings could have significant public health implications. Adoption of comprehensive use mandate policies resulted in a 6-9% reduction in almost all measures of high-risk prescription for commercially insured individuals. This translates to 36,000 fewer people having overlapping opioid prescriptions and 44,000 fewer people with overlapping opioid benzodiazepine prescriptions, for the non-elderly, privately insured population alone. Reduced morbidity and mortality associated with the reductions in high-risk opioid prescriptions for the entire population are likely substantial.